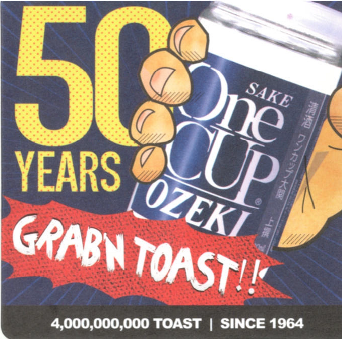 This year marks fifty years since Ozeki launched its famous ‘One Cup’, back in 1964. To mark this historic occasion Ozeki sponsored a tasting with The British Sake Association in London on 17th November. Held at the newly-refurbished Tombo Café and Deli in South Kensington, the event was oversubscribed, with 30 attendees. Some attendees were fairly new to sake, and others more familiar; but even the regulars members, who have been to events before, found it very useful to have a re-cap on the main categories. Presented by Sarah Wedgbury from JFC guests were treated to a taste of eight different sake, under the heading ‘Learn The Basics’ . Tasting began with a low alcohol sparkling sake, and moved on to a daiginjo, junmai, tokubetsu junmai, honjozo and of course One Cup, a futsu shu, before finishing with a taruzake. Future events in the pipeline include: In January at United Ramen in Islngton –Warm Sake and Hot Ramen – perfect for warming you up in the chilly days after Christmas; then in February, in time for Valentines Day, Chocolate and Sparkling Sake. Details to follow. The Association is always happy to hear from breweries or importers who would like to sponsor an event – our aim is to educate the consumer, with as wide a range of tastes as possible. This entry was posted in Blog and tagged British Sake Association, Japan, JFC, ozeki, Sake, sake event. Bookmark the permalink.